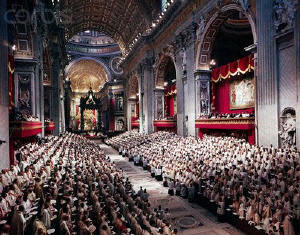 What are Catholics to think of Vatican II? The liturgy of the word is stressed (Sacrosanctum Concilium, §9), and the banquet aspect (§10), as well as active participation (§§11,14), and therefore the vernacular (§§36,54). The New Mass (cf. question 5). The Church of Christ subsists in (not is) the Catholic Church (Lumen Gentium, §8), It is also in “separated Churches” (Ut Unum Sint, §11). which has separated brethren in separated “Churches” (Unitatis Redintegratio, §3), All the baptized are in Christ’s Church (Ut Unum Sint, §42). which ought to be as sisters (Unitatis Redintegratio, §14). And so there is no need to convert, e.g., the Orthodox. Seminarians should take into account modern philosophy, progress in science (Optatam Totius, §15), Secular university studies and abandoning Thomism. The Church renounces privileges civil authorities grant her (§76). Catholic religion no longer to be the religion of any States. Extreme Unction should be an Anointing of the Sick (§§73,75). New matter, form and subject (i.e., the sick, not just those in danger of death). 3 Ut Unum Sint, Pope John Paul II, May 25, 1995. 4 Cf., The Joint International Commission for the Theological Dialogue between the Roman Catholic Church and the Orthodox Church, which forbade mutual "proselytizing." Balamand, Lebanon, June 17-24, 1993. Contrary condemned statement: "...the best condition of society is the one in which there is no acknowledgment by the government of the duty of restraining... offenders of the Catholic religion, except insofar as the public peace demands" (Pius IX, Quanta Cura). "All the gods of the Gentiles are devils." Ps. 95. "... beware lest thou have a mind to imitate the abominations of those nations" (Dt. 18:9). "Now, episcopal consecration confers, together with the office of sanctifying, the duty also of teaching and ruling..." (§21). "This (episcopal) dignity, in fact, depends immediately on God as to the power of orders, and on the Apostolic See as to the power of jurisdiction..." (Deesemus Nos, Pius VI). And it is neo-Modernist tendencies that the Council is all about ("...Pope John Paull II makes not Holy Scripture, but rather Assisi, the shibboleth for the current understanding of the Council." Pope John Paul II's Theological Journey to the Prayer Meeting of Religions in Assisi, Part I, p. 46 [appendix 2]). Nor by reason of the ordinary universal magisterium, because this is not a defining power, but one of passing on what was always believed. The “universality” in question is not just one of place (all bishops) but also of time (always) (cf., Vatican I and principle 6). Nor even by reason of the simply authentic magisterium, because the object of all magisterium is the deposit of faith to be guarded sacredly and expounded faithfully (Vatican I, Dz 1836), and not to adopt as Catholic doctrine the “best expressed values of two centuries of ‘liberal culture,’” even if they are “purified” (Cardinal Ratzinger, Gesu, November 1984, p. 72; cf. Gaudium et Spes, §§11, 44). Can we commemorate the Council? Washington Post: SSPX has solution to Vatican II debacle! Catholic Faith or the Triumph of the Will? 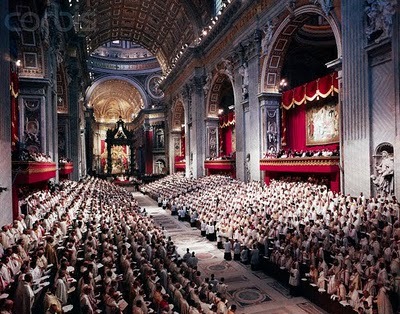 Two Interpretations of Vatican II: Myth or Reality? Covers the two opposing views of the Council. Includes the article "The Erosion of the Council's Authority"
How are Catholics to respond to the present crisis in the Church? Post-Conciliar Church: is it a new religion? What Should We Make of Assisi I & II?